American elderberries are Mother Nature’s favourite fruit. These hearty and robust bushes thrive in the fertile growing conditions of Quebec. Dark purple with a rich blackberry-raspberry flavour, American elderberries are also superior in their health properties. They have been scientifically proven to have 2 to 3X the concentration of antioxidants, vitamin A and vitamin C than cranberries and blueberries. Academic research consistently links elderberry consumption to numerous health benefits, including strengthening the immune system because they demonstrate their ability to inhibit viruses such as lnfluenza A and B and H1N1. 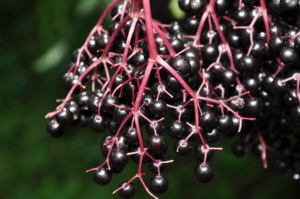 There is an abundance of ongoing research about elderberries and elderflowers. Some are looking into to the health benefits of elderberry on the prostate gland while others are looking into its protective effects against strokes . There is also also research being done on elderflowers and the potential for preventing and/or helping with insulin resistance. We will keep you posted on research results as they are published.